Full name is Eduardo Jose Rodriguez. Signed by Calvin Maduro (Orioles). Set a career high in wins (13) during his 4th full season in the Red Sox organization ... Also posted a career-low 3.82 ERA (55 ER/129.2 IP) over a career-high 27 appearances (23 starts) ... His .722 winning percentage (13-5) was the 8th-highest in the AL (12th in MLB) ... Made 5 scoreless starts, tied for the 3rd-most by a Red Sox in 2018 ... Recorded a 24.0-inning scoreless streak (6/29-9/1), the longest of his career and the 6th-longest in MLB in 2018 ... Held a 5.29 ERA through his first 6 starts ... Went 10-5 with a 3.33 ERA (36 ER/97.1 IP) over his final 21 appearances (17 starts) ... Went 6-2 with a 3.38 ERA (25 ER/66.2 IP) in 15 outings (11 starts) against AL East opponents ... The Red Sox won 10 of those 11 starts ... The Red Sox won each of his first 7 starts, the longest season-opening streak by a Red Sox since Clay Buchholz in 2013 (7, 4/3-5/6) ... Earned the win in 3 consecutive starts from 4/13-25, allowing 3 ER over 6.0+ IP in each ... On 4/13, after BAL's 1st batter of the game, Trey Mancini, singled and scored in the 1st inning, none of Rodriguez's remaining 23 BF reached scoring position (6.0 IP, 5 H, 2 BB, 8 SO) ... Struck out 10 Rangers over 6.0 IP on 5/5 at Fenway, his 2nd career start with 10+ SO (13, 9/25/16 at TB) ... Won a career-best 6 consecutive starts from 5/20- 6/17 ... Was tied for the 2nd-longest streak in the AL during the year, trailing only Blake Snell (9, 8/10-9/23) ... Prior to Rodriguez, the last Red Sox age 25 or younger to earn the win in as many as 6 consecutive starts was Roger Clemens (9 straight, May-June 1986) ... Allowed 3 ER or fewer in a career-best 8 straight starts from 5/10-6/17 (2.38 ERA, 12 ER/45.1 IP) ... Gave up 2 ER or fewer in the last 6 outings of that stretch, also a career-long streak ... Did not allow a run in a career-best 24.0 consecutive innings from the 5th inning on 6/29 at NYY through the 5th inning on 9/1 at CWS ... Was the 2nd-longest active scoreless streak in the majors at the time ... Made 3 consecutive scoreless starts from 7/4-14 (17.0 IP), the longest such streak of his career ... The only other Red Sox with such a streak in 2018 was Chris Sale (6, 7/11-9/16) ... Logged 6.0 scoreless IP on 7/4 at WSH, his longest scoreless outing since 9/23/17 at CIN ... Exited his start on 7/14 vs. TOR in the 6th inning after injuring his right ankle on a play at 1st base ... Placed on the 10-day disabled list with a right ankle sprain on 7/15 ... Made 2 starts for Double-A Portland on rehab assignment, tossing 4.0 scoreless IP on both 8/20 and 8/27 ... Was activated from the DL on 9/1 and started that night at CWS ... Retired his first 12 batters faced, striking out 10 ... Ended the night with a season-high 12 SO in 5.2 IP, his 2nd start with 10+ SO in 2018 (3rd career) ... Also extended his career-long ML scoreless streak to 24.0 IP before allowing his only run in the 6th inning ... Allowed just 1 run over 32.0 IP between BOS (24.0) and Portland (8.0) from the 5th inning on 6/29 at NYY through the 5th inning on 9/1 at CWS ... Limited the Blue Jays to 1 run on 5 hits over 6.0 IP on 9/13 at Fenway Park ... Did not issue a BB, his longest outing without a BB since 5/11/17 at MIL (also 6.0 IP) ... Threw just 78 pitches (52 strikes) on 9/13 ... Was his 1st career start with as few as 78 pitches over 6.0+ IP ... Joined David Price (76 pitches over 7.0 IP on 3/30 at TB) as the only Red Sox starters with 78 pitches or fewer over 6.0+ IP in 2018 ... Each of his last 4 regular-season appearances came in relief (9/24-30) ... 3 of them were scoreless ... In those outings, recorded 9 SO in 6.1 IP ... Prior to 2018, had made only 1 relief appearance in the majors (4/19/17 at TOR) ... POSTSEASON: Appeared in 7 postseason games (1 start), including multiple games in each round ... Allowed 3 ER in 1.2 IP in Game 2 of the ALDS, but surrendered 0 runs and 0 hits in each of his next 5 outings (2.2 IP, 2 BB, 4 SO) ... Threw a scoreless 9th inning in Game 3 of the ALDS at Yankee Stadium ... Recorded a perfect 9th inning in Game 3 of the ALCS at HOU (2 SO) ... Struck out George Springer to end the game ... Retired his lone batter faced in Game 1 of the World Series, preserving a 5-4 lead by getting Cody Bellinger to fly out to end the 7th inning ... Also retired his lone batter faced in Game 3 of the World Series, striking out Joc Pederson to end the 5th inning ... Made his lone start in Game 4 of the World Series at Dodger Stadium, throwing 5.0 scoreless frames before surrendering 4 runs in the 6th inning ... 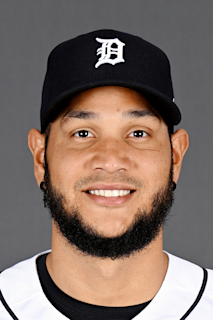 Became only the 4th pitcher born in Venezuela to start a World Series game, joining Les Straker (1987-MIN), Freddy Garcia (2005-CWS), and Anibal Sanchez (2012-DET). Set career highs in appearances (25), starts (24), innings (137.1), and strikeouts (150), going 6-7 with a 4.19 ERA (64 ER)...Prior to the season, named to Venezuela's roster as a designated pool pitcher in the World Baseball Classic. Made his 1st career Opening Day roster in his 3rd full season in the Red Sox organization. In 6 Interleague starts, went 2-0 with a 2.72 ERA (11 ER/36.1 IP) and .217 opponent AVG (28-for-129). Held RHH to a .230 AVG (97-for-421), the 4th-lowest mark among AL lefties. Faced 42 RHH without allowing a hit from the 1st inning on 4/13 vs. PIT through the 1st inning on 4/30 vs. CHC (0-for-35, 7 BB, 14 SO)...Made 4 scoreless starts, trailing only Chris Sale (10) for the most by a Red Sox pitcher in 2017. His 4 scoreless starts with 6.0+ IP were the most by a Red Sox 24 or younger since Jon Lester's 7 in 2008. Went 4-1 with a 2.77 ERA (17 ER/55.1 IP) and a .209 opponent AVG in his first 10 starts through May...The Red Sox won 7 of his first 10 starts...Started the Sox' 4th game of the season on 4/8 at DET, his 1st career start in the month of April. Made his 1st career relief appearance on 4/19 at TOR and retired all 3 batters faced in the 8th inning (2 SO). After allowing 2 ER in the 1st inning on 4/13 vs. PIT, did not allow a run in his next 15.1 IP, ending in the 5th inning on 4/30 vs. CHC. Won a career-high 4 consecutive decisions from 4/23-5/26, tossing a quality start in all 7 outings during the streak...Was his longest career streak of quality starts...Posted a 2.25 ERA (11 ER/44.0 IP) and a .204 opponent AVG (32-for-157) in that stretch. Went 3-0 with a 2.81 ERA (10 ER/32.0 IP) over 5 road starts from 4/23-5/21... Limited opponents to a .195 AVG (22-for-113) in those games. Carried a no-hitter into the 5th inning on 4/23 at BAL (W, 6.0 IP, H, 5 BB, 7 SO). Tossed a career-high-tying 8.0 IP on 5/21 at OAK and earned the win, snapping a 3-game losing streak. Placed on the 10-day disabled list (right knee subluxation) on 6/2, following his 11th start on 6/1 at BAL, and was not activated until after the All-Star break. From the start of 2017 through 5/31, ranked among AL leaders in ERA (8th, 2.77), opponent AVG (6th, .209), opponent OPS (12th, .652), and WHIP (10th, 1.12). Placed on the 10-day disabled list on 6/2 with a right knee subluxation ...Made 1 rehab start with Double-A Portland and 2 with Triple-A Pawtucket. Activated from the DL on 7/17 and made 14 more starts, going 2-5 with a 4.72 ERA (40 ER/76.1 IP)...On 8/11 at NYY, surrendered just 2 hits over 6.0 scoreless frames but did not factor into the decision. Went 2-1 with a 1.78 ERA (5 ER/25.1 IP) and a 0.99 WHIP in 4 starts from 9/5-23. Earned the win on 9/12 vs. OAK (6.0 IP, H, R, 4 BB, 9 SO), his 1st since 5/26 vs. SEA (11 starts in between). Threw 7.2 scoreless innings on 9/23 at CIN (3 H)...Did not allow a hit until there was 1 out in the 4th inning...POSTSEASON: Made a relief appearance in Game 2 of the ALDS at HOU but did not record an out (H, 2 R, HBP)...On 10/17, underwent a right knee patellofemoral ligament reconstruction...The procedure was performed by Dr. Andrews at the Andrews Institute in Pensacola. Made 20 starts in his 2nd ML season, missing the Red Sox' first 51 games on the disabled list...Posted a 3.24 ERA (28 ER/77.2 IP) with a .210 opponent AVG in 14 starts after being recalled from Triple-A Pawtucket on 7/15. Among AL pitchers after the All-Star break (min. 75.0 IP), ranked 3rd in opponent AVG, 8th in SO/9.0 IP (9.15), 11th in ERA, and 12th in WHIP. Carried a no-hitter into at least the 5th inning on 8/16 at BAL (into 5th), 9/4 at OAK (8th), and 9/20 at BAL (5th)... Also took a no-hitter into the 4th inning on 8/1 at SEA. Surrendered 2.30 HR/9.0 IP in his first 9 starts through July (12 HR/47.0 IP), compared to 0.60 HR/9.0 IP in his final 11 starts (4 HR/60.0 IP)...His 0.60 HR/9.0 IP ratio led the AL and ranked 5th in the majors among the 107 pitchers who threw at least 50.0 innings from 8/1 on. In 8 road starts after the All-Star break, posted a 1.90 ERA (10 ER/47.1 IP), a 0.87 WHIP, and a .161 opponent AVG...Among ML starters on the road in the 2nd half (min. 30.0 IP), ranked 1st in opponent SLG (.256), 2nd in opponent AVG, 5th in ERA, and 4th in WHIP. Opponents batted only .183 (19-for-104) when leading off an inning, the 2nd-lowest mark in the AL and 6th-lowest in the majors (min. 100 BF). Made 3 starts in which he struck out 8+ batters and recorded 16 or fewer outs. Over 3 starts at Camden Yards from 5/31-9/20/16, recorded a streak of 29 straight outs without allowing a hit (3 BB). Began the regular season on the 15-day DL with a right patella subluxation...Made 5 rehab starts with Triple-A Pawtucket from 4/28-5/24, going 0-3 despite a 3.54 ERA (11 ER/28.0 IP). Was returned from his rehab assignment and reinstated from the DL on 5/31...Earned the win at BAL that night, allowing 2 runs on 6 hits over 6.0 frames on just 89 pitches. Went 0-3 with a 10.03 ERA (26 ER/23.1 IP) in 5 June starts...Optioned to Pawtucket following his start on 6/27 at TB after allowing career highs in hits (11) and earned runs (tied, 9). Made 2 starts with the PawSox following the option, allowing just 2 runs on 5 hits over 10.0 IP...Dealt 7.0 shutout frames on 7/3 vs. Columbus in an eventual 16-inning walk-off win...Was his longest scoreless outing at the Triple-A level, and longest at any level since his ML debut on 5/28/15 at TEX (7.2 IP, 3 H, 0 R). Recalled on 7/15 and allowed 3 or fewer runs in each of his next 7 starts (7/16-8/16), posting a 2.52 ERA (11 ER/39.1 IP) and a 1.14 WHIP in those outings while striking out 39 and walking just 12. Earned the win at Yankee Stadium on 7/16, allowing just 1 ER over 7.0 frames and improving to 4-1 in 5 career starts vs. NYY...Became the 1st Red Sox since 1913 to give up 2 or fewer ER in each of his first 5 career starts vs. NYY...Would extend that streak on 8/11 vs. NYY at Fenway (7.0 IP, 3 H, ER, BB, 6 SO), becoming the 1st ML starter to limit the Yankees to 2 or fewer ER in each of his first 6 career starts vs. the club since Mike Garcia did so in his first 6 from 1949-51 (Drew Smyly later joined that group). On 7/22 vs. MIN, struck out 8 batters in just 5.1 IP. From 8/11 through the end of the season, held lefties to a .156 AVG and a .188 SLG (5-for-32, 2B). Allowed just 5 hits over 3 starts from 8/16-9/4, holding opposing hitters to a .088 AVG (5-for-57). Held the Orioles hitless through 4.0 IP on 8/16 at Camden Yards before being removed from the game with left hamstring tightness (7 SO, 2 BB). In 5 September starts, posted a 2.89 ERA (9 ER/28.0 IP) and a .192 opponent AVG (30 SO, 7 BB). On 9/4 at OAK, did not allow a hit until surrendering an infield single to Marcus Semien with 2 outs in the 8th inning...Finished with 1 hit allowed over 8.0 scoreless innings, tying a career-long outing (also 8/18/15 vs. CLE)... Was the 1st Sox starter to throw 8.0+ innings and allow 1 or 0 hits since Jon Lester on 5/3/14, also vs. OAK. Struck out 29 of 69 batters faced over his final 3 starts (16.2 IP, 15.7 SO/9.0 IP)...Struck out the side in 5 of his last 8 full innings. On 9/20 at BAL, allowed his 1st hit with 2 outs in the 5th inning... Over 3 starts from 5/31-9/20, recorded a streak of 29 straight outs at Camden Yards without allowing a hit (3 BB). Struck out a career-high 13 hitters on 9/25 at TB, tied for the 7thmost SO by a Sox LHP since 1913...Tied the highest strikeout total by any pitcher since 1913 in an outing of 5.1 IP or shorter (also Alex Cobb on 5/10/13 vs. SD and Zack Greinke on 9/25/12 vs. SEA)...His final 12 outs were SO, from the 2nd out of the 2nd inning to the 1st out of the 6th...Struck out his final 6 batters faced, combining with Heath Hembree (5 straight SO) to set a ML team record by striking out 11 consecutive batters...The Sox set a single-game franchise record with 23 SO that day (in 10 inn. ), becoming the 5th team ever with 23+ SO in a game and the 1st to do so in 10 innings or fewer. In his final start of the regular season on 10/1 vs. TOR, struck out 9 batters over 5.0 IP, allowing 3 runs on 3 hits... Fanned the side in the 2nd and 5th innings. Following the season, made 4 starts for Magallanes in the Venezuelan Winter League (1-1, 3.38 ERA, 4 ER/10.2 IP, 4 BB, 12 SO)...Pitched 5.0 scoreless innings on 12/20 at Margarita. POSTSEASON: Named to the Red Sox' ALDS roster, but did not appear in a game. Recalled by BOS in late May and made 21 starts as a 22-year-old in debut ML season, going 10-6 with a 3.85 ERA (52 ER/121.2 IP). Honored as the Boston BBWAA's Red Sox Pitcher of the Year and Red Sox Rookie of the Year in his 1st full season in the organization. Went at least 5.0 IP and allowed 1 or no ER in 12 of his starts, tying for the most such starts through any player's first 21 career ML games since at least 1914 (also Stephen Strasburg, Matt Harvey, Dwight Gooden, Cal Eldred), the most by a LHP...Matched Gooden (1984) as the only pitchers with 12 such starts within their first 21 games, all in the same season. His 21 starts were the most in a season by a Red Sox rookie since Daisuke Matsuzaka in 2007 (32 starts), most by a left-handed Sox rookie since John Curtis in 1972 (21 starts). Among Red Sox pitchers with at least 100.0 IP, ranked 1st with a .255 opponent AVG (120-for-471)...Finished 2nd among that group in ERA and WHIP (1.29), trailing only Clay Buchholz (3.26 ERA, 1.21 WHIP in 113.1 IP). Led AL rookies in wins and finished 2nd among left-handed AL rookies with both 98 SO and 13 quality starts...Was the Red Sox' 1st left-handed rookie to reach double digits in wins since John Curtis in 1972 (11- 8)...His 13 quality starts were most by a lefty rookie with BOS since Hal Wiltse in 1926 (15). Was the 1st Red Sox pitcher to win at least 10 games and post a sub-4.00 ERA before turning 23 since Mike Nagy in 1969...Was the 1st Red Sox left-hander to do that since Babe Ruth in 3 straight years, 1915-17 (Source: Elias). Recalled from Triple-A Pawtucket on 5/28 and made ML debut that night at TEX (7.2 IP, 3 H, 0 R, 2 BB, 7 SO)...Became the 1st pitcher in Red Sox history to go at least 7.2 IP, allow no runs, give up 3 hits or less, and strike out as many as 7 batters in his ML debut...Was the longest scoreless outing for a Red Sox in his ML debut since Billy Rohr on 4/14/67 at NYY (9.0 IP). Was 22 years, 51 days old on 5/28, the youngest Red Sox left-hander to start and win his ML debut since Billy Rohr at 21 years old in 1967...Was the youngest pitcher to make his ML debut as a starter for the Red Sox since Michael Bowden at 21 years old on 8/30/08 vs. CWS, the youngest Red Sox LHP to do it since Abe Alvarez at 21 years old on 7/22/04 vs. BAL. Had a 0.44 ERA (1 ER/20.2 IP) after his first 3 starts, allowing 1 ER and 8 hits total while striking out 21 over 20.2 IP...According to Elias, was the 1st pitcher in baseball history to go at least 6.0 IP while allowing no more than 1 run or 3 hits in each of his first 3 ML games...Elias also says he was the 1st pitcher to begin a career with 3 straight starts of 6.0+ IP, 7+ SO, and 1 ER or fewer since ER became an official stat (1912 in NL, 1913 in AL). Allowed 10 total ER over his last 7 starts beginning 8/18...His 2.08 ERA (43.1 IP) in that stretch ranked 2nd in the AL to CLE's Cody Anderson (1.66) and 3rd in the majors among LHP, trailing only PIT's J.A. Happ (1.34) and LAD's Clayton Kershaw (1.53). Posted an AL-best 1.87 ERA (17 ER/81.2 IP) in 13 night games, trailing only CHC's Jake Arrieta (1.51) among all major leaguers (min. 75.0 IP)...Had a 7.88 ERA (35 ER/40.0 IP) in 8 starts during the day. Held opponents to a .229 AVG with RISP (24-for-105), including just 5-for-46 (.109) with RISP and 2 outs. Went 3-1 with a 2.22 ERA (6 ER/24.1 IP) in 4 starts against the Yankees...Was the 1st Red Sox pitcher to beat the Yankees 3 times in a season before turning 23 since Mike Nagy in 1969 (3-0), and the 1st Red Sox LHP to do it since Babe Ruth in 1917 (5-0). Began the year with 8 starts for Triple-A Pawtucket...Went 4-3 with a 2.98 ERA (16 ER/48.1 IP) and 44 SO compared to 7 BB before his call-up. Following the season, ranked by Baseball America as the No. 5 prospect in the International League. Acquired by the Red Sox at the trade deadline...Spent the regular season in the Double-A Eastern League between the Orioles' Bowie affiliate and Double-A Portland, going 6-8 with a 3.60 ERA (48 ER/120.0 IP) and 108 strikeouts in 22 combined starts...Ranked 3rd among EL leaders with 8.1 SO/9.0 IP and was 10th in ERA...Held left-handed hitters to a .216 AVG (29-for-134) without a HR...Began the year with BAL's Double-A Bowie...In 16 starts, went 3-7 with a 4.79 ERA (44 ER/82.2 IP)...On 7/31, was acquired by BOS in exchange for LHP Andrew Miller...Allowed 4 total runs in his 6 regular season starts for Portland following the trade (0.96 ERA)...Allowed 1 or no runs in all 6 starts...From 8/1 through the end of the regular season, led the EL with 39 strikeouts in his 37.1 innings for the Sea Dogs...Allowed only 30 hits and 8 walks...Won his Red Sox organizational debut on 8/3 vs. Trenton, striking out 7 and allowing 1 run in 5.1 IP...Posted a 2.39 ERA (21 ER/79.0 IP) over his last 14 regular season starts beginning on 6/18...Allowed 3 runs (2 ER) with 6 strikeouts over 6.2 innings in a playoff start for Portland in an eventual 6-3 win in Game 3 of the Eastern League Division Series vs. Binghamton...Made his Triple-A debut in Game 4 of the Governors' Cup Finals at Durham and allowed 2 ER in 7.0 innings, a 4-3 PawSox win in 13 innings...Following the season, recognized by Baseball America as the No. 4 prospect and as possessing the best fastball among Red Sox minor leaguers. Posted a 2.85 ERA (86.0IP, 27ER) in 14 starts with Single-A Frederick before being promoted to Double-A Bowie in late June...Named Organizational Pitcher of the Month in May, when he went 5-0 with a 2.23 ERA (41.0IP, 10ER) in six starts...Selected to Carolina League Mid-Season All-Star Team and pitched a scoreless inning in the All-Star Game...Named to MLB All-Star Futures Game and pitched a scoreless inning, striking out one...Named the O's No. 3 prospect after the season by Baseball America...Was named a top 100 overall prospect by ESPN.com (43), Baseball Prospectus (61) and MLB.com (68)...Pitched for Surprise in the AFL after the season, earning the win in the championship game, starting and tossing 3.0 scoreless innings (2H, 4K). Led the GCL Orioles in strikeouts (46) and was second in games started (10). Led the DSL Orioles with a 2.33 ERA (min. 5 starts) and 62 strikeouts...Struck out a career-best 11 batters June 12 againstthe DSL Cubs...Threw his first complete game shutout (5.0 innings) July 9 against the DSL Rockies. September 1, 2018 Boston Red Sox activated LHP Eduardo Rodriguez from the 10-day injured list. August 20, 2018 Boston Red Sox sent LHP Eduardo Rodriguez on a rehab assignment to Portland Sea Dogs. July 15, 2018 Boston Red Sox placed LHP Eduardo Rodriguez on the 10-day disabled list. Right ankle sprain. May 5, 2018 Boston Red Sox activated LHP Eduardo Rodriguez. May 2, 2018 LHP Eduardo Rodriguez roster status changed by Boston Red Sox. April 8, 2018 Boston Red Sox activated LHP Eduardo Rodriguez from the 10-day disabled list. March 26, 2018 Boston Red Sox placed LHP Eduardo Rodriguez on the 10-day disabled list. Recovery right knee patellofemoral ligament reconstruction surgery. July 17, 2017 Boston Red Sox activated LHP Eduardo Rodriguez from the 10-day disabled list. July 4, 2017 Boston Red Sox sent LHP Eduardo Rodriguez on a rehab assignment to Pawtucket Red Sox. June 29, 2017 Boston Red Sox sent LHP Eduardo Rodriguez on a rehab assignment to Portland Sea Dogs. June 2, 2017 Boston Red Sox placed LHP Eduardo Rodriguez on the 10-day disabled list. Right knee subluxation. April 19, 2017 Boston Red Sox activated LHP Eduardo Rodriguez from the paternity list. April 17, 2017 Boston Red Sox placed LHP Eduardo Rodriguez on the paternity list. December 6, 2016 LHP Eduardo Rodriguez assigned to Navegantes del Magallanes. July 15, 2016 Boston Red Sox recalled LHP Eduardo Rodriguez from Pawtucket Red Sox. June 28, 2016 Boston Red Sox optioned LHP Eduardo Rodriguez to Pawtucket Red Sox. May 31, 2016 Eduardo Rodriguez roster status changed by Boston Red Sox. May 24, 2016 Boston Red Sox sent LHP Eduardo Rodriguez on a rehab assignment to Pawtucket Red Sox. April 28, 2016 Boston Red Sox sent LHP Eduardo Rodriguez on a rehab assignment to Pawtucket Red Sox. September 17, 2015 LHP Eduardo Rodriguez assigned to Navegantes del Magallanes. May 28, 2015 Boston Red Sox recalled LHP Eduardo Rodriguez from Pawtucket Red Sox. March 20, 2015 Boston Red Sox optioned LHP Eduardo Rodriguez to Pawtucket Red Sox. November 20, 2014 Boston Red Sox selected the contract of Eduardo Rodriguez from Pawtucket Red Sox. September 9, 2014 LHP Eduardo Rodriguez assigned to Pawtucket Red Sox from Portland Sea Dogs. August 3, 2014 Portland Sea Dogs activated LHP Eduardo Rodriguez. July 31, 2014 LHP Eduardo Rodriguez assigned to Portland Sea Dogs. May 22, 2014 Bowie Baysox activated LHP Eduardo Rodriguez from the 7-day disabled list. February 11, 2014 Baltimore Orioles invited non-roster LHP Eduardo Rodriguez to spring training. June 28, 2013 LHP Eduardo Rodriguez assigned to Bowie Baysox from Frederick Keys. April 1, 2013 Eduardo Rodriguez assigned to Frederick Keys from GCL Orioles. February 13, 2013 Baltimore Orioles invited non-roster LHP Eduardo Rodriguez to spring training. September 2, 2012 Eduardo Rodriguez assigned to GCL Orioles from Frederick Keys. September 1, 2012 LHP Eduardo Rodriguez assigned to Frederick Keys from Delmarva Shorebirds. June 6, 2012 Eduardo Rodriguez roster status changed by Delmarva Shorebirds. May 31, 2012 Delmarva Shorebirds placed LHP Eduardo Rodriguez on the temporarily inactive list. April 3, 2012 LHP Eduardo Rodriguez assigned to Delmarva Shorebirds from GCL Orioles. September 2, 2011 Eduardo Rodriguez assigned to GCL Orioles from Aberdeen IronBirds. August 30, 2011 Eduardo Rodriguez assigned to Aberdeen IronBirds from GCL Orioles. December 13, 2010 Eduardo Rodriguez assigned to GCL Orioles from DSL Orioles1. October 8, 2010 LHP Eduardo Rodriguez assigned to Navegantes del Magallanes. May 29, 2010 DSL Orioles1 signed Eduardo Rodriguez.